Regimental Standard: Attention, Hive Citizen! Before playing their first game, each player will need to assemble their fighters (and ideally paint them! ), so that each one is carrying the appropriate equipment. The assembly guide included in the box shows how to assemble each fighter so that they match up with one of the Ironlords or Carrion Queens Fighter cards. Whether you’re fighting a skirmish in ancient tunnels, pushing into the territory of a rival gang or even making a last stand in your own stronghold, you’d best pay attention to your goals, Juve… or risk losing everything. Each game of Necromunda is defined by the scenario you choose to play. These range from brief but bloody chance encounters between rival gangers to full-scale raids deep into enemy territory. Games can be linked together into campaigns in which your gang grows and accumulates wealth. The scenarios in the Necromunda: Underhive box focus on confrontations fought in the labyrinthine tunnels of the lower hive cities where many newly-founded gangs first seek to establish themselves. 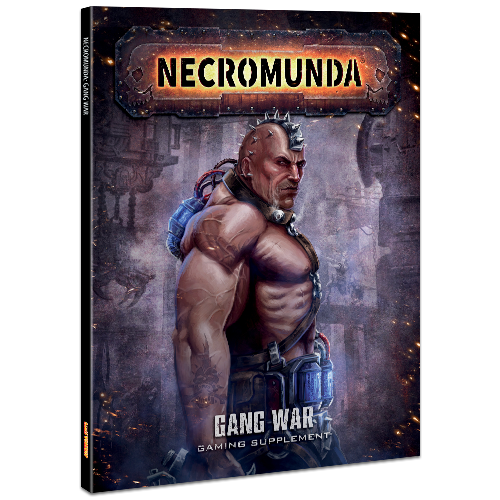 Once your gang has gained some notoriety, the Necromunda: Gang War expansion will allow you to take the action into the open spaces of the manufactory domes above. In the Necromunda: Underhive box you’ll find a wealth of tiles representing the Zone Mortalis, the deadly tunnels beneath Hive Primus. These can be configured in a variety of ways, and the included doors, barricades, booby traps and other scenery mean you can create endlessly variable battlefields to fight over. In these places where man has been allowed to grow unchecked, teeming billions infest the vast hive cities. Even here the press of humanity is not strong enough to turn back the madness, or deflect the distaff forces of Chaos, heresy and death. Life is cheap. The bullet and the grenade are kings. Neither day nor night touches the billions of souls trapped in this nightmarish world. For them, there is just the unblinking septic gloom of ancient fluorescence. The putrid atmosphere of the underhive is stained with the dark patina of age. A brown haze fills air which has been recycled a million million times and offers the inhabitants but the meanest measure of life it can without choking them. The Imperium of Mankind stretches across the galaxy, encompassing over a million habitable worlds and untold billions of the Emperor’s subjects. It is the most extensive and populous empire that has ever existed in the history of humanity, and it is ruled as it has been for the last ten thousand years by the Divine Champion and Protector of the human race, the God-Emperor of Mankind. The Emperor has long since ceased to live in any normal sense. Ten thousand years ago, following His titanic battle against the rebel Warmaster Horus, Primarch and Arch-champion of Chaos, His mutilated and barely-alive body was installed inside a sophisticated life-support machine known as the Golden Throne. The Emperor can no longer speak and it is doubtful if He comprehends events which take place in the material universe, as His powerful mind stalks through that nefarious region of pure energy known as the Realm of Chaos, staving off the enemies of Mankind. The actual administration of the Imperium is therefore undertaken by a vast bureaucracy known as the Adeptus Terra – the Priesthood of Earth. Hive worlds are planets whose industrial output, while technologically far cruder than that of a Forge World of the Adeptus Mechanicus, nonetheless feeds the Imperium’s unquenchable hunger for base manufactured goods. They utilise vast towering metal cities intended to maximise the exploitation of both natural resources and manpower, and invariably, the surfaces of such worlds are polluted wastelands, ashen plains made barren by generations of mining and used as dumping grounds for the toxic byproducts of industry. Their populations are densely concentrated, their lives a short and miserable toil unless they reject it entirely and throw in their lot with the numerous gangs and other outcasts that exist in the cracks. 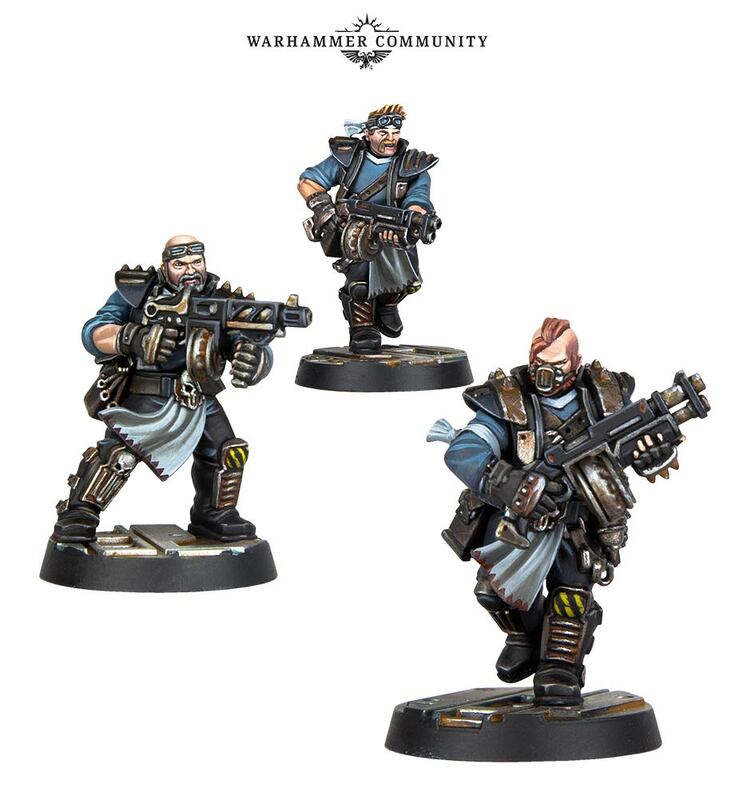 Founded long ago in the depths of the Dark Age of Technology, Necromunda was brought into the Light of the Emperor by the Imperial Fists Legion during the Great Crusade. It is said that the ash wastes from which the great hives rise are a by-product of the devastation wrought upon the world during its brief defiance of the coming of the Imperium, but the truth is lost beneath the toxic plains. Necromunda is a world of mines, factories, refineries and processing plants. The planet is a vast powerhouse of industry, making thousands and thousands of different items for use throughout nearby planetary systems, and nothing which can contribute to the planet’s output has been left untouched. Necromunda is host to several thousand hive cities, some vast in scale and home to billions, others decrepit and populated only by the dead. Below a hive’s functioning levels lies a honeycomb of ancient domes, tunnels, ruins and structures from Necromunda’s long-dead past. These ruins lie at the very bottom of each city, below the clan-dominated manufactory zones and the ash wastes: they are the undercities, the oldest and deepest parts of Necromunda’s hives. These undercity zones – called by most the ‘underhive’ – often predate the construction of the hive above by many centuries, even millennia. They are remnants of Necromunda’s true cities, built before the planet’s natural ecology was destroyed, when there were no encroaching ash wastes, and it is quite possible that the remains of the colony vessels that first brought Mankind to the planet still lie beneath some hives. 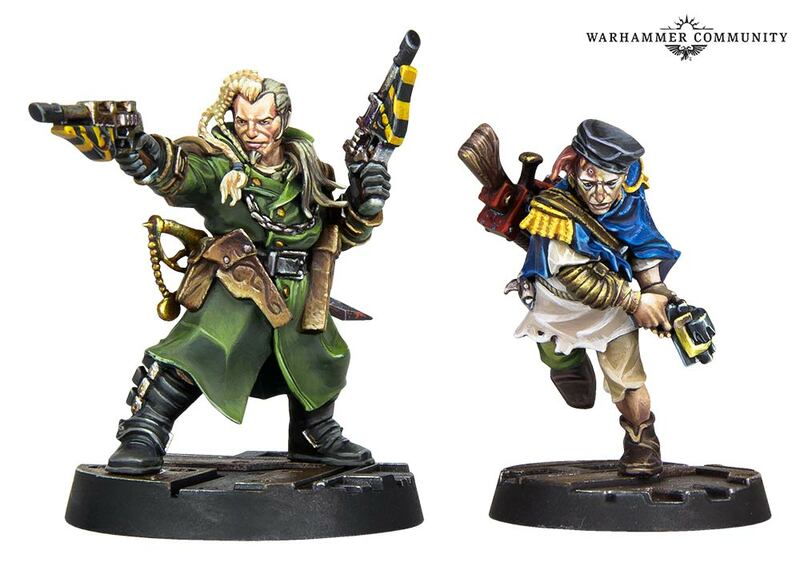 Necromunda is ruled by a small number of factions of incredibly wealthy and powerful bodies known as the Great Houses. The Great Houses are primarily investors – they make nothing and provide no service. 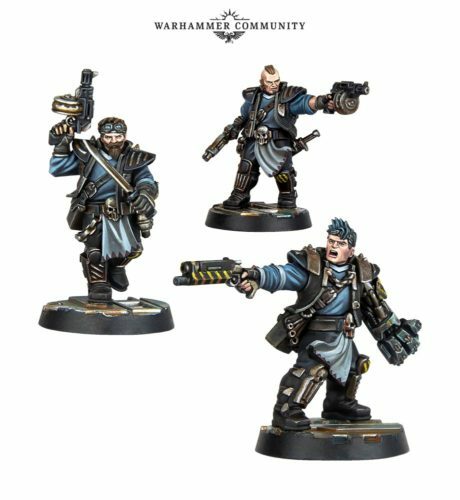 Subservient to these are the Clan Houses, who maintain the vast manufacturing base of Necromunda. Every House has its own cultural traditions, distinctive linguistic traits, codes of dress and behaviour, as well as unique concerns and aptitudes. Though distinct and often antagonistic towards one another, the Houses are also interdependent upon one another for the provision of specific and rare items or services. The underhive lies beneath the hive cities, beyond the laws of House and hive. Its depth varies from a few hundred metres to several kilometres, and its extent is neither constant nor strictly delineated, the crumbling margins of the hive above simply melting into the upper zones of the underhive. It is a no-man’s land: the Badzones… downhive. Here an individual can make a new beginning or come to a sudden end, and everyone knows there are fortunes to be won in the depths for those willing to take the chance. Each player’s gang is made up of a number of fighters, each of which is represented by a plastic miniature and a Fighter card. Necromunda: Underhive contains two sets of Fighter cards representing the Ironlords Goliath gang and the Carrion Queens Escher gang. 1. The fighter’s name. If they are a Leader or Champion, it will also be shown here. 2. The fighter’s value, in credits. 4. The weapons the fighter is carrying. 5. Any skills the fighter may have. 6. Any equipment (including armour) carried by the fighter. The game also includes a number of blank Fighter cards. We recommend that new players use the Ironlords or the Carrion Queens to start with, but experienced players might wish to generate their own gang, for which they will need to use the blank Fighter cards. A number of dice are used in Necromunda to resolve the outcome of various actions. The game makes use of four different types of dice: D6, Injury Dice, Firepower Dice, and Scatter Dice. Explosions, jets of flame and area effects are represented in the game by Blast markers and Flame templates, which are used to determine how many fighters are hit by such an attack or an effect. Two card Vision Arc templates are included (one for Escher fighters and one for Goliath fighters), which can be used to determine a fighter’s vision arc. Subject: Necromunda Underhive - website is live! OK, this looks like the thread to back, nice OP. I’m hyped! Already building terrain. 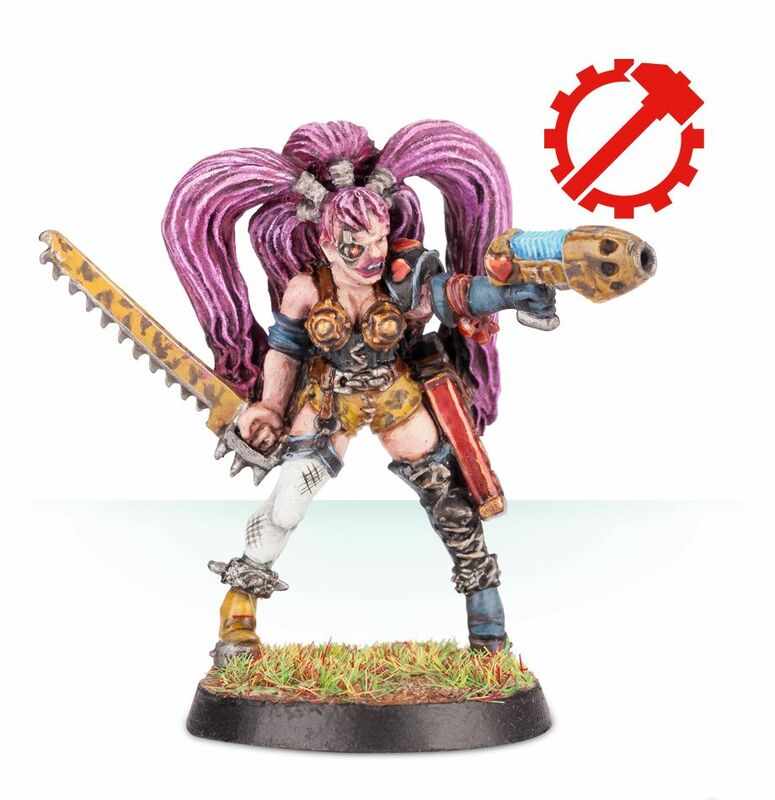 Love the fact that they've got all the old Mark Gibbons Necromunda artwork in that vid above. Good stuff! Yep, that is some great art! I hope the Gang War book will hit the streets on the same day as the base game. I wasn't much interested in this but it looks great. There has been a surprising amount of interest on it locally. 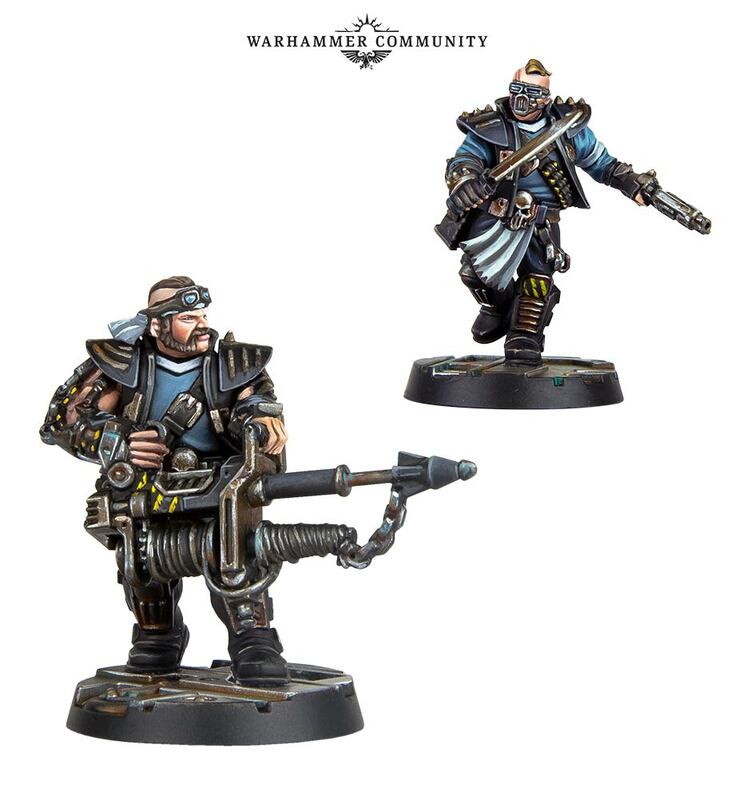 Really hoping for some kick arse Spyrer models, too! Just had time to watch the videos... damn I'm so HYPED! The rule snippets they show all look great. Love the addition of cards and the new characteristics. Also... that voiceover lady is the best. Duncan had me worried with those "And now, we're going to build Bonesnapper. We'll notice all the parts are numbered so you know what parts you need!" But then they turned out to be customizable anyway. Whew! So much excite for this. Wonder who made the music for the trailers and that? I'd buy it. Haven't seen the price yet. But there are two full gangs, some terrain, and a lot of stuff to play (cards, tokens, cardboard tiles), so I don't think it will be cheap. Remember, the boxed set is a complete game unto itself - albeit one we can expand upon if we wish. More stuff than BB but less than Overwatch. "Full gangs" means.. ??? not much. I am curious if we get 10 models a side, 10 vs 8, 12 vs 15, etc..
Just had time to watch the videos... damn I'm so HYPED! The rule snippets they show all look great. Love the addition of cards and the return of the old characteristics. Also... that voiceover lady is the best. 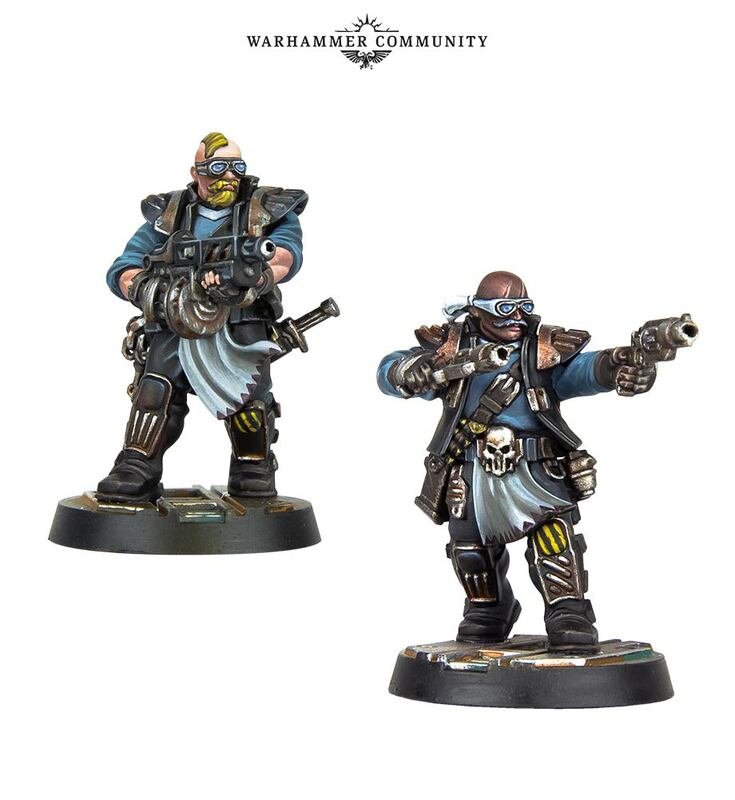 I'm interested in the Escher, but for the Goliath I'd more rather build some orks as stand-ins. 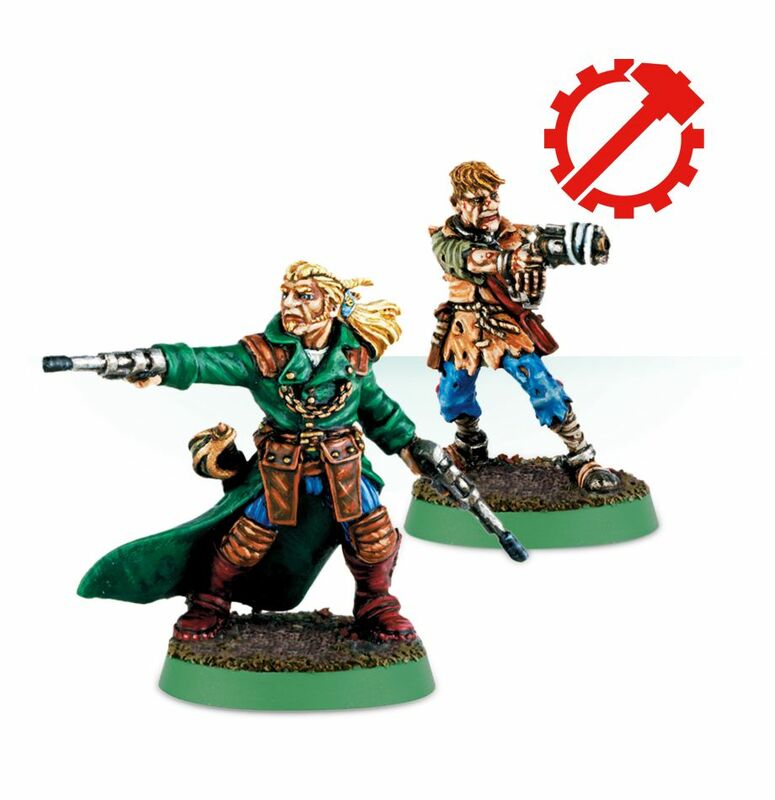 I'm a bit annoyed that the rules for actual necromunda (gang wars) is a separate buy, to me its the equivalent of day 1 DLC, but I'll be buying it all anyway. 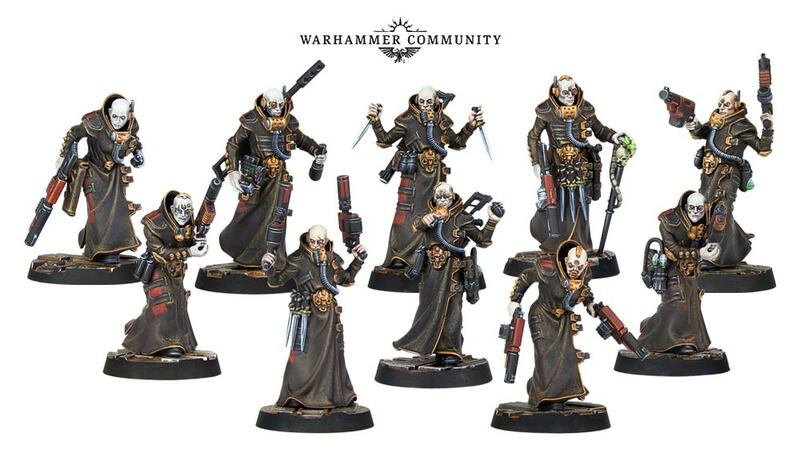 I'm just waiting for pics of my Delaque gang now. If the pictures are to be believed, ten per side with 5 unqiue poses per gang and a variety of arm and head options. Hopefully there're more weapon option than what show in the manual from the build video. Because I really hate the ugly lasgun the Escher had. The Irad Widow seem to have some kind of autopistol. Im really interesting to see the rules for yesteryear gangs, and what does it means.. I'd bet we'll get some kind of made to order release...? I suspect Scavvy and Outlander gangs to begin with. But if we get Confrontation gangs, I'm buying them all! I like the ploy cards. Am I being a NooB with my positioning? Or am I up to something suitably sneaky? Can't wait to see the Gang specific ones. The pictures of the complete gangs show that there's five torso/legs for each gang, and then you can add different heads, hair and arms. 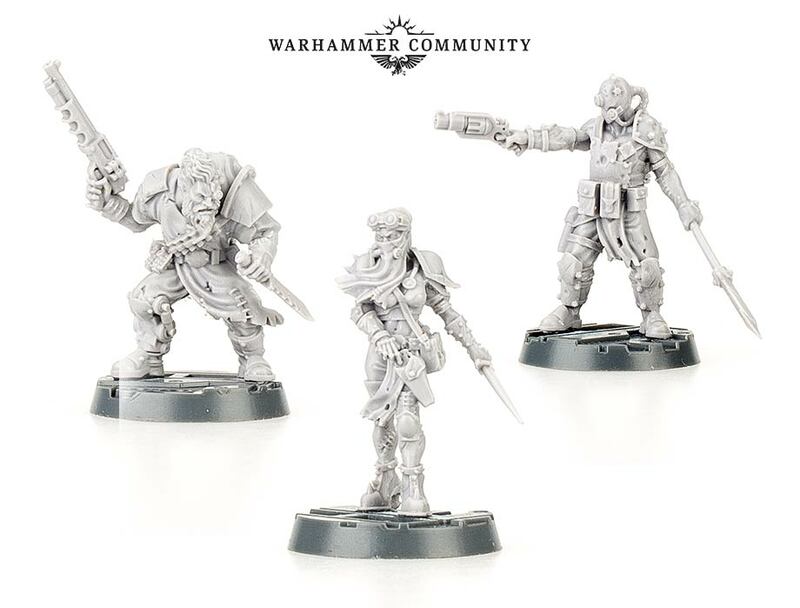 It looks like the Necromunda Underhive box set has the option to follow the instructions and build two pre-constructed gangs complete with stat cards, so new players can get stuck in right away without needing to worry about which weapons to choose - but also allows you to build your own gang if you're more experienced.